Framed Limited Edition Canvases are Already Marked at Unframed Prices! This offer does not apply to Limited Edition Paper. View our collection of Limited Edition Artwork to begin your search for your perfect piece. Click here to see our complete selection of styles of museum quality frames. It is simple, choose an unframed Limited Edition Canvas, then add a matching frame using the helpful frame configurator! That’s it! Framed Limited Edition Canvases have been marked at the discounted unframed price; no promo code required. Shop Limited Edition Art Here. Frame must be the same intended size as purchased LE Canvas. Rare, custom or non-standard frames are not eligible. No promo code required. Frame availability is limited to stock on hand. Frame must be the same intended size as purchased LE Canvas. Rare, custom or non-standard frames are not eligible. Free promotional frame value cannot exceed standard Thomas Kinkade Studios Limited Edition Canvas frame pricing for like size (see pricing grid). 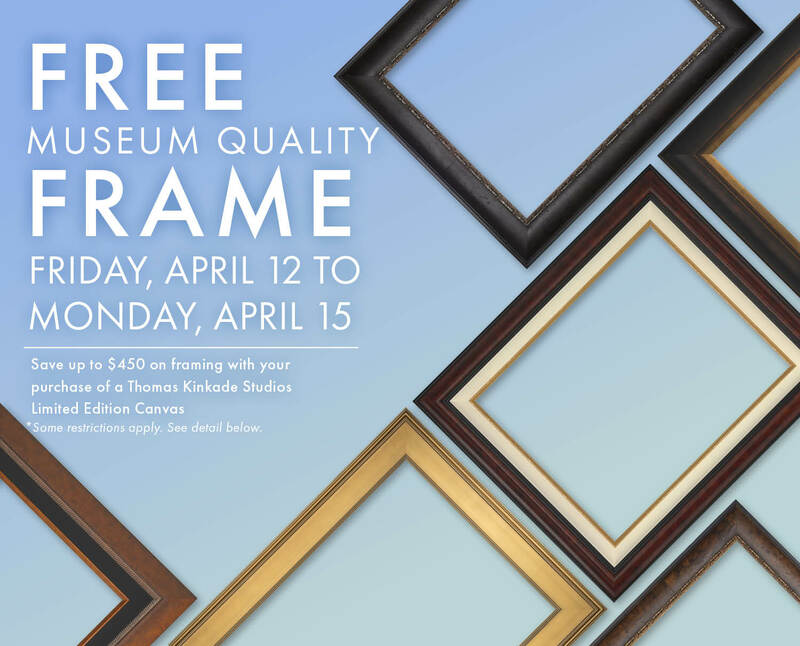 Thomas Kinkade Studios Deluxe Frames, Cabernet and Caramel are eligible for the discount amount based on size but the buyer must pay the difference if the price of the frame exceeds the standard frame grid price. Please note that some frames are made-to-order and may slightly increase delivery times. This offer is not applicable on past purchases. Promotion is valid at participating galleries and ThomasKinkade.com only and cannot be combined with any other offer. Promotion expires Monday, April 15, 2019 at 11:59 PST.